These two photos were taken in January - February 1962. Note the buses still have the Fifth Avenue Coach colors, lettering and slogan. F.Y.I. . . . I wish to note that virtually every bus photo that had been hosted by Photobucket as was shown on individual posts within this thread, has now disappeared and been replaced where the image had been with a "Please Update Your Account To Enable 3rd Party Hosting" notice. Apparently they are now demanding an arm and a leg in order (i.e. in the hundreds per year) to enable linking pictures on their site to places like this. It has also affected other forums where people have placed pictures in the past. I would recommend alternate sites (depending on your situation) like Flickr or Imgur or Postimage. As to the early 1962 pics . . . it figures, as FACL was still operator at that point. The strike that ended their run of these bus routes (and ushered in a new operator, MaBSTOA) was still a month or two away. Great period photos; thanks for sharing! 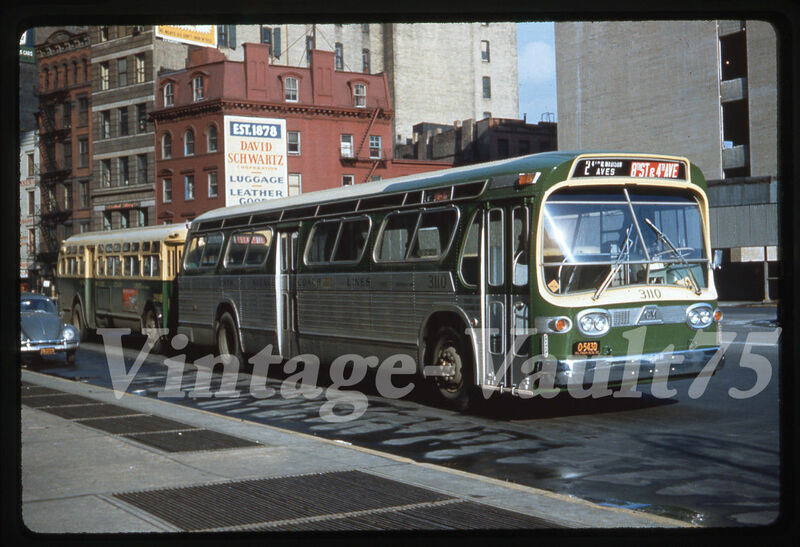 This pic has been shown in B&W in some books; but, courtesy user 'VintageVault75' on eBay, here it is in living color - FACL 3110, the last of the first batch of non-air-conditioned 'New Looks' built (in front of an Old Look), holding down the 2 - Fourth and Madison Avenues line in 1960. Looks like a Johnson farebox inside (the type that would be carried over by Keene and used until MTA switched to MetroCards). That is a Grant Electrofarer fare box not a Johnson. Looks similar from a distance, but thanks for advising. When was this photo posted on EBay? A few months ago. It has since been sold. Route 21, Houston-Avenue C and route 22, Pitt and Ridge Street were acquired by New York City Omnibus on August 26, 1940. Both of these routes were originally owned and operated by Triangle Bus Corp. a small and little known operator in the lower eastside. Their route M10 became the 21 and M40 became the 22. Triangle operated the service using nine Mack single door CW models and eleven used White Indianas. The sale to NYCO was as a result of a two week strike. Route 22 was discontinued in 1942. Rush hour service was restored but by the late 1940s a once-a-day service was maintained until the city take over in order to hold the franchise. How the last-named route became designated M-40 . . .
And it was on March 1, 1943 (no doubt due to the same ODT regulations that led to the 1942 changes to Rt. 22) that 9 - Seventh Avenue was discontinued, though after WWII it ran sporadically once a day to the end of the 1940's - but was definitely deader than a doornail by the time of the 1954 one-way conversions of Eighth Avenue and parts of Seventh. 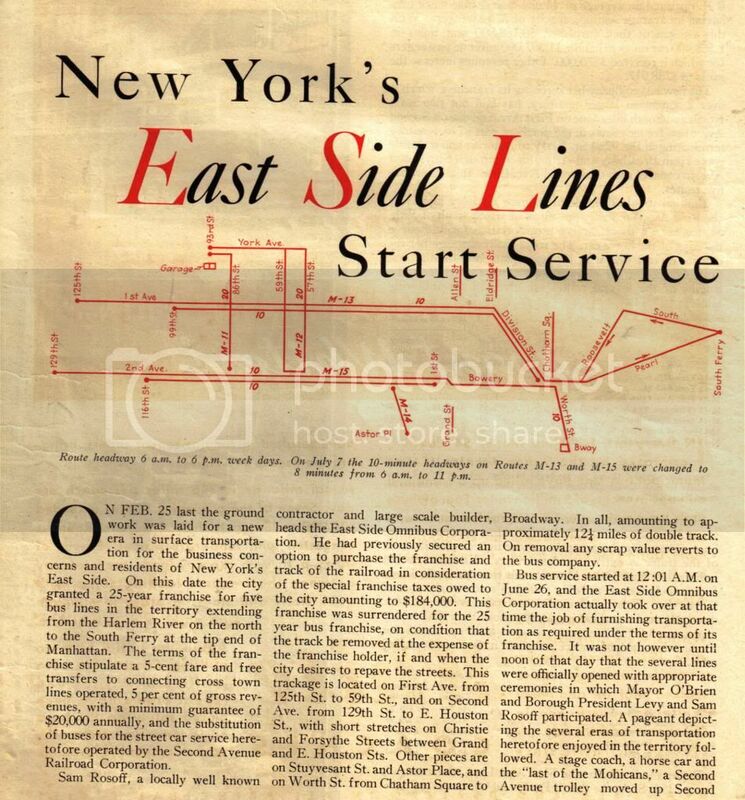 The map below is a copy of one published in 1943 by Third Avenue transit for its Bronx lines. Note that even the trolley lines are identified by the route numbers for the buses that would replace them. The cars, however, only carried the large letter route designator on the dash. Conspicuously missing was the first Bx-49 bus, designated Parkchester-West Farms and running only since Oct. 11, 1941. It was discontinued on or about June 6, 1943 as part of a huge round of bus service cutbacks ordered by the federal Office of Defense Transportation (ODT) - and never resumed. 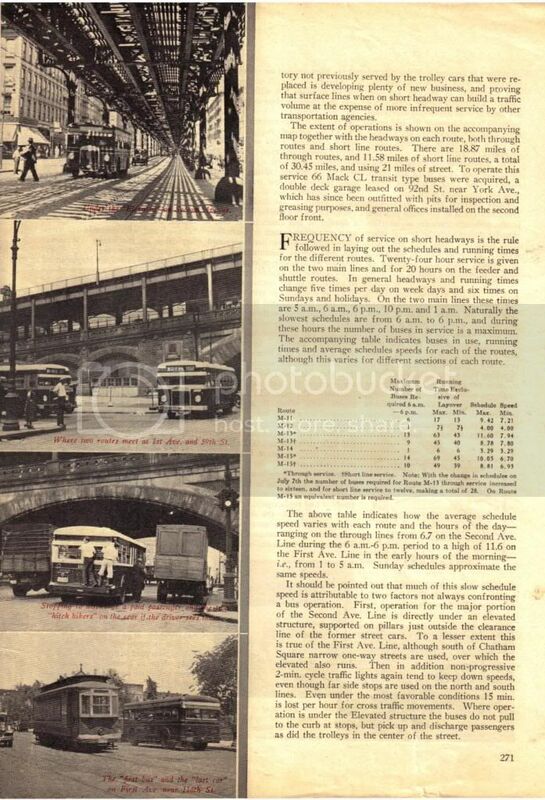 The Highbridge route, originally started as Bx-50 on Jan. 29, 1942, was apparently also eliminated (on what date?) for the duration of the war; it wasn't until after the end of World War II in 1945 (what date? I ask) that service on the Highbridge line was resumed as the second Bx-49. Listed as '46 Fifth Avenue (Mt. Vernon)' would be run after c.1950 by Westchester Street Transportation as Route C; '47 Mount Vernon-Subway' would be bustituted Dec. 17, 1950 as WST Route B; that listed as '43 Broadway-Yonkers' would in 1952 be converted to bus service under Yonkers Transit Corporation (formerly Yonkers Railroad Company) aegis. Still don't know about '44 Jerome Avenue' though. 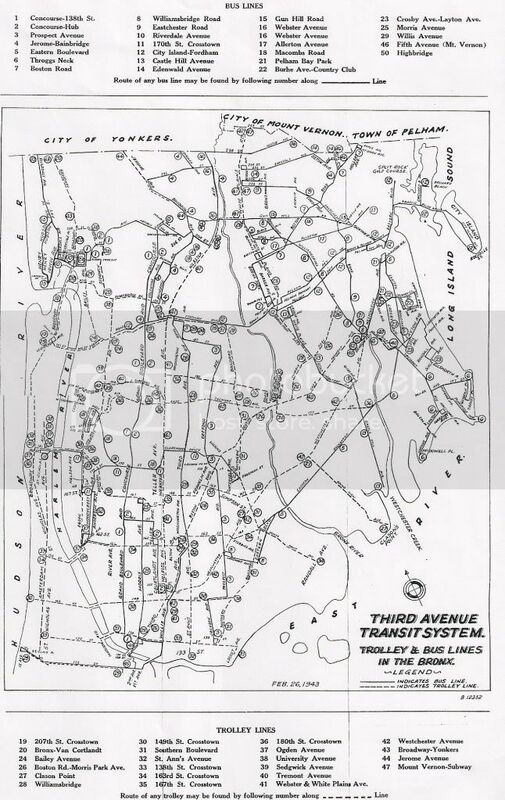 And of the '47 routes' in the Bronx cited in New York Times' coverage of the strike against Fifth Avenue Coach Lines and Surface Transit in 1962, all based on the October 1958 map issued by ST and WST, five were add-ons: Bx-6A, Bx-6B, Bx-10A, Bx-10B and Bx-15A. By then, there was Bx-1 through 38, 40 through 42, and 49. Apparently Bx-12A and 12B and Bx-14A were unaccounted for; never mind the second Bx-50 which was the summer-only Freedomland shuttle bus. 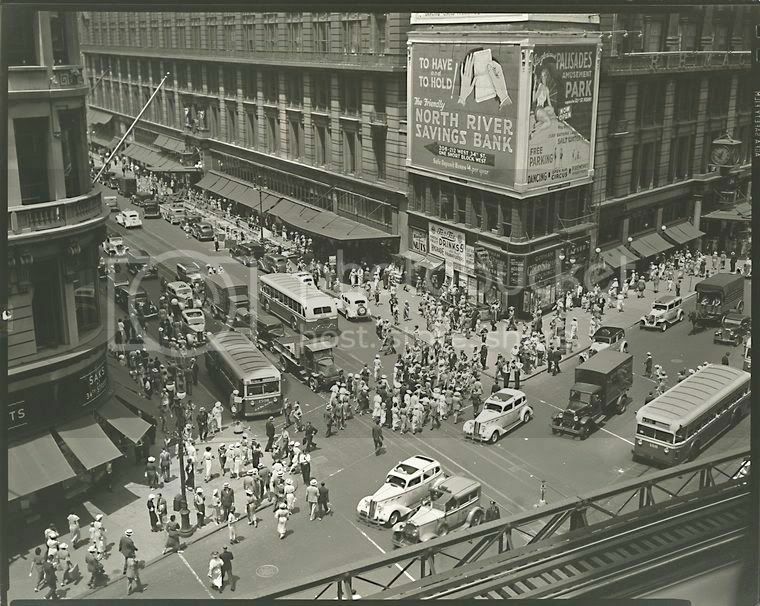 To complement Mr. Linsky's photo, here's another angle of Herald Square taken during the summer of 1936 with a grand view of Macy's. The bus picking up passengers looks like a 1935 Yellow Model 728 - I'm sure Mr. L can ID them. And yes, there's Tastee once again. Not sure when it became Nedick's. Nedick's is long gone - the current occupant is the Sunglass Hut selling nothing but ... what else? Photos from the NY Public Library files - not copyrighted. Check out the Mack AC and the numerous cabs - none of which are Checkers! Have to wonder about the North River Savings Bank billboard - the type used for the bank name seems to have been a forerunner to the Star Wars logo, no? 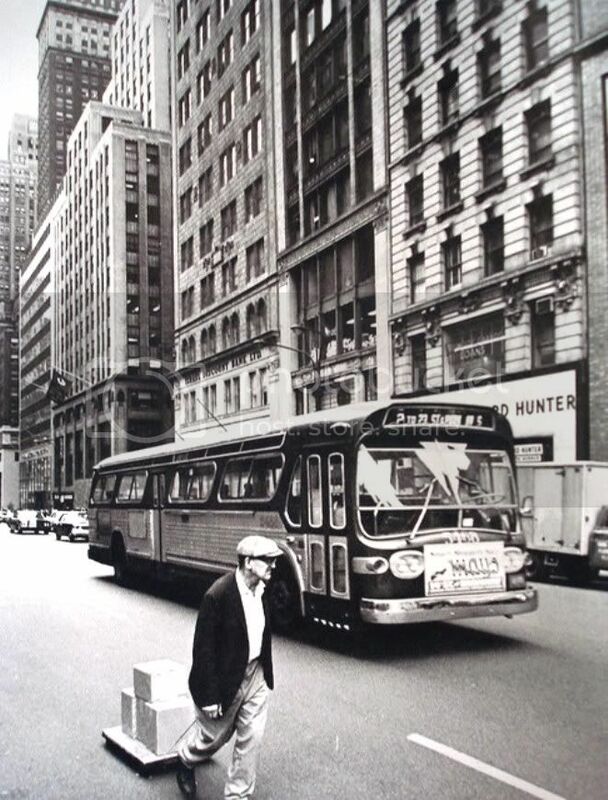 It's Manhattan's Garment District circa 1965 as we see fleet number 5468 - a 1965 GM Model TDH 5303 and one of 325 numbered between 5201 and 5525 delivered to the then recently formed Manhattan and Bronx Surface Transit Operating Authority (a/k/a MABSTOA). # 5468 is heading southbound on 7th. Avenue toward its termination at 23rd. Street and Park Avenue South on the #2 Line. This shipment of buses represented only the second new order for MABSTOA since its takeover of Fifth Avenue Coach and its affiliates in 1962 and went quite a way toward replacing the hundreds of aging coaches that were part of that inheritance. Mays Discount Department Store was the 'cats meow' of the era and spent fortunes on bus ads as can be seen under 5468's windshield. Photo thanks to the Klaus Lehnartz Collection. 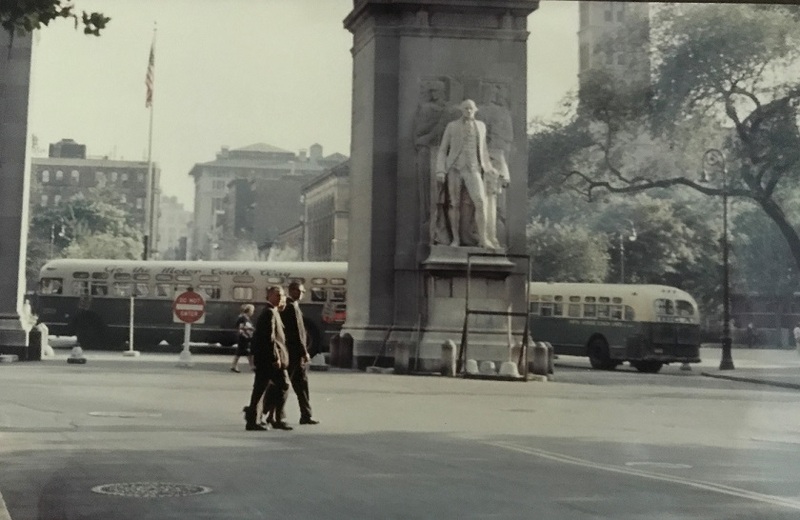 This would have been between 1966 and 1969 (more specifically around 1968), the 2 in this case being inherited from the NYCO Division side (the ex-FACO Division 2 having been rebranded 2A the very day Fifth and Madison Avenues were converted one way on Jan. 14, 1966, and remaining as such until July 1, 1974 when it became today's M2). Fifth Avenue (from which this pic was actually taken; looking north from 42nd Street, The Record Hunter being a key to identifying where this was photographed) was already one-way southbound at the point of this pic; 5468 was among the buses assigned to 146th Street (now Mother Hale) depot where both 2 and 2A were based. This 2 route was discontinued on March 2, 1969, replaced north of 116th Street and Lenox Avenue by the 101A - Third, Lexington and Lenox Avenues line (renumbered M102 on July 1, 1974). NYC Omnibus and sister 5th Ave. Coach used duplicative public numeric route #s for both networks that ranged from 1 to 20 (FACO) and 1 to 22 plus TB (NYCO). As another example NYCO's route # 10 (8th Ave-Cent Park West) was officially M41 but this number was never used publicly. The NYCO #3 and #4 routes operated along Lexington Ave., parallel to FACO's #3 and #4 on Fifth Ave. Somehow the public never seemed to confuse the route #s.
Surface Transit and NYC Transit routes did use the M### scheme on the route signs, thus M104 was always the Broadway route and M15 was the 1st and 2nd Ave. route, for example. In 1974 MABSTOA and NYCTA ended all duplicative Manhattan route numbers and rechristened many routes. So for example, M15 was restricted to the 1st and 2nd Ave. route. The #15 23rd St. Xtown became M26; the Fifth Ave.-Jackson Heights line became M32. And later those numbers changed again so that crosstown routes took the same number as their principal street, so M26 became M23. M32 was recast as Q32 to reflect the borough where the majority of mileage occurs. And the numbers will no doubt change again as routes change and combine. Incidentally, the ex-NYCO Division #15, when M- prefices were added to their and ex-FACO Division routes come ~Jan. 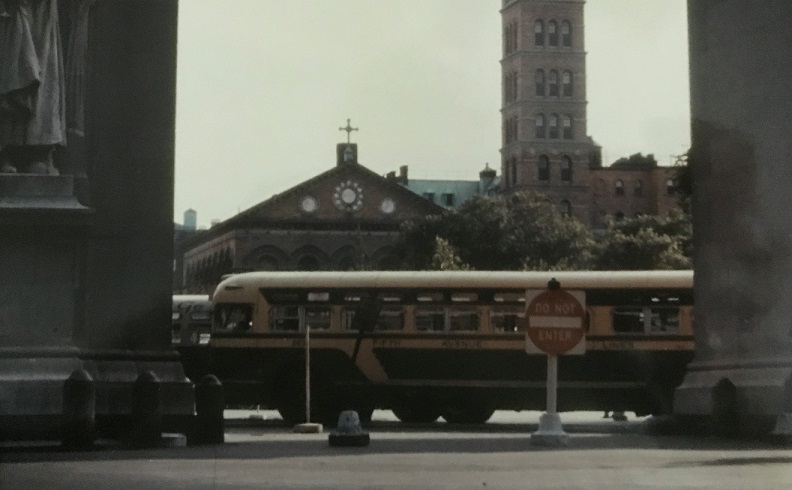 1, 1973 (with the arrival of GMC T6H-5309A's), became M15, while the ex-FACO Division Jackson Heights route #15 became QM15; and on a tangent, the Elmhurst Crosstown route #16 was designated QM16. In so doing they unwittingly duplicated the designation of two Green Bus Lines express routes to Manhattan (the Lindenwood-Manhattan and Rockaway Park-Manhattan routes respectively). Small wonder the routes were ultimately renumbered in '74. 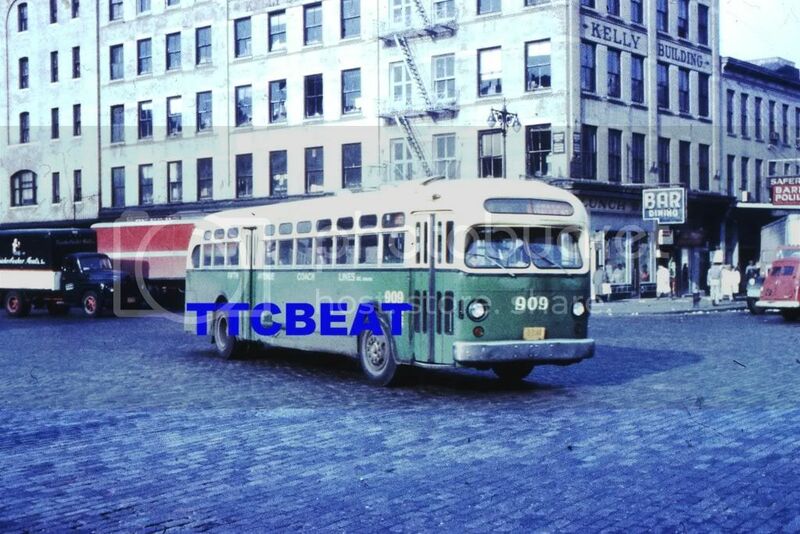 In a photo taken no earlier than 1956, we see fleet # 909 - a 1942 Yellow Coach Model TD 4505 flagged for the then newly formed Fifth Avenue Coach Lines, Inc, (FACL) but originally purchased by New York City Omnibus Corp. (NYCO) for its Eighth Avenue Coach Corp. (EACCO) subsidiary. The TD 4505's, of which 733 were built between late 1941 and mid 1942 with 46 going to EACCO, were among the last pre war buses produced by Yellow before limited production essential to the war effort started in 1944 with distribution strictly supervised by the U.S. Office of Defense Transportation (ODT). # 909 is seen in the Bowling Green section of downtown Manhattan on Beekman Street not far from city hall and is sporting a face lift including a chromium plated heavy 'paired window' style bumper, recessed headlamps to replace the original 'bug eyes' and neatly placed aftermarket signal lights just over the bumper. Of note are the original cobble stone streets that Manhattan was noted for and which dated from as far back as the mid nineteenth century. Photo courtesy of TCCBEAT and is up for bid on eBay as item # 400308938255. Looks more like this was taken at Ninth Avenue and 14th Street, looking south from the east side of Ninth. The destination sign would give this away to be Rt. 11, heading north to La Salle Street and Broadway (it was extended further north to 132nd Street on June 20, 1965). 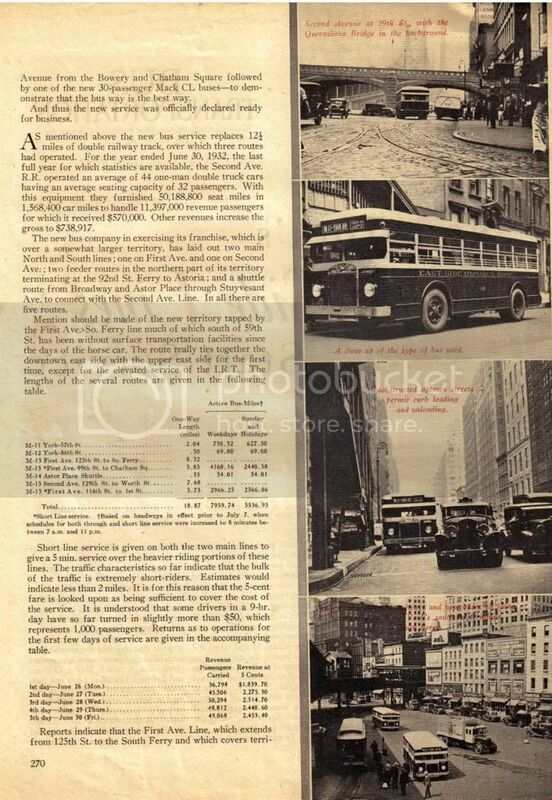 From the pages of an early thirties issue of Bus Transportation Magazine (my Bible) we see a concise and well illustrated history of trolley service replacement on Manhattan's First and Second Avenues including spurs as taken over by the newly formed East Side Omnibus Corporation. It is interesting to note that not long after this momentous occasion, East side formed the affiliated Comprehensive Omnibus Corporation and, by political shananigans pulled by it and the also newly formed New York City Omnibus Corporation, were able to secure long time franchises for lucrative crosstown routes which, at the time, were operated by Green Bus Lines on yearly permits. However, a two year court battle ensued delaying the takeovers but eventually winning the routes for the new companies and giving Green Line carte blanche in the entire south western territory of fast developing Queens County. The rest, of course, is history! Photos courtesy of '4509bus' and up for auction on eBay as item # 370767025329. Curious . . . at what point were M-12 - York Avenue-86th Street and M-14 - Astor Place shuttle discontinued? Definitely, I reckon, pre-BoT takeover . . .